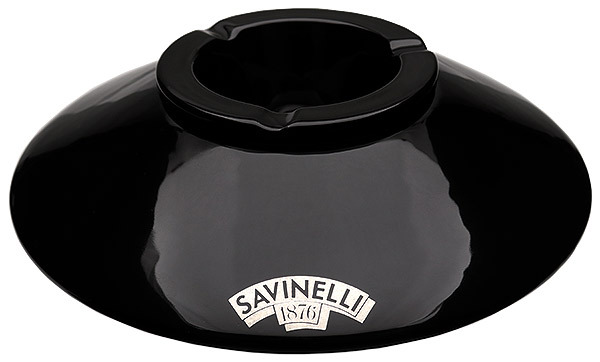 While the design of the Savinelli Deco ashtray definitely has a stylized look, its form in fact follows function. The small, tapered ash-bowl up top, you see, is separable, and has no bottom of its own, actually being a tapered ring. What appears to be its bottom at first is in fact a cone projecting up from the bottom of the main body of the ashtray, which is itself hollow. By simply lifting the top half an inch or so, any dottle and ash is dropped down out of sight (and scent), into the hollow body. As for the main body's curious disc shape, that serves to create another funnel when you've removed the top and turned the ashtray over - making it that much easier to empty out everything when it pleases you to do so. Measurements: H 3 1/4" D 9"